Hey, you! What do you think you're doing? Sit up straight. Arms behind you back. Keep your mouth closed. 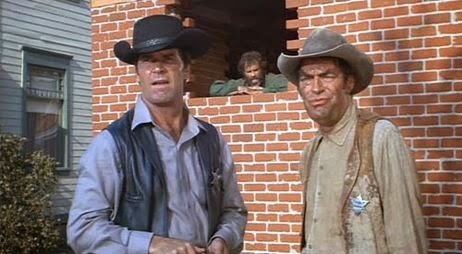 And just clap your eyes on this great western adventure brought to you by the Director: Burt Kennedy; and the Actors: James Garner, Joan Hackett, with Jack Elam. It was made in 1969 and lasted for a whole 92 minutes. As soon as the dandy sharp-shooter called Jason McCullough (James Garner) first strolled on into town, immediately, Mayor Perkins (Harry Morgan) and his cronies said to themselves, 'He's the one. He's just the type of man we could use to run that dastardly Danby family the hell away from here'. Yeah. I'm not kidding you, folks. For a start, they hire him to be their new sheriff, just so he could look after their bar-less and empty prison. Then they allow him to arrest Joe Danby (Bruce Dern), the youngest of their clan, because he killed a man, earlier on in the day. Before finally they give Jason their permission to hire the one-time sh*t shov... errr... stable-hand, Jake (Jack Elam), to be his trusted yet somewhat smelly deputy. But hey! Don't get ahead of yourselves, pal. These manipulative townsfolk don't always know what the hell they're playing at! 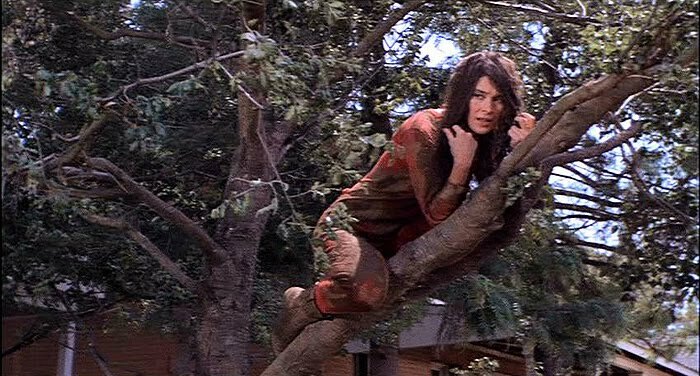 I mean, I bet you anything they never foresaw how the Mayor's crazy yet rich daughter, Prudy (Joan Hackett), took an instant liking to Jason when she first saw him. Or that the rest of the Danby's would want to pay their locked-up kin a visit in his makeshift jail-cell. Still. I suppose that's most probably why what next transpires all hits the skids when a gaggle of gunmen set their sights on our brand new sheriff. As outlaws fall to the floor - a town becomes a right bloody boar - the Danby crew all shoot like bums - and look out Australia, for here we comes. Now to be completely honest with you, folks, I thought that 'Support Your Local Sheriff' was a pretty nifty film to watch. It wasn't anything outstanding mind you. I'll have to give you that. But yet again, it was one of those nice comedy-westerns, which was well-written, well-acted, and had a well-polished sheen to it. Especially compared to some of the other comedy-westerns I've seen made during this era. Just try to think of it as a dubbed down version of 'Evil Roy Slade' starring Maverick. And you'll get the basic gist of what I mean by this. Oh! Wait a minute. Please don't take what I've just said the wrong way. I'm not trying to imply that this flick was 'Luke warm' by any stretch of the imagination. If anything, I found it to be a sort of 'send up' of your more conventional western premise. For instance, you have the Sheriff who doesn't really want to be a Sheriff. You have the token love interest that's really a bit of a nutter. You have the local townspeople who don't really want to be saved. Plus finally, you have the bad-guys who aren't really that bad. Furthermore, something else about this picture I kind of dug, were those scenes between James and Jack, because they had a rather warm air about them. Almost personal in tone. And I did enjoy the whole conceit behind a bar-less jail, particularly how James' character tricked Bruce's character to say in it. However, on the reverse side of my praise, there were certain things about this film I wasn't too keen on either. Like how most of the sets came across very-very clean and vivid, for a town that was supposed to be very-very dark and dirty. Also, on occasion, the overall production exhumed a strange yet apparent cartoon-like quality in both its character plus conceptual plot-line. Again. Try to think of it as a cross between the 1966 Batman television series set in the Wild West. And you'll get the basic gist of what I mean by this. OK. That's enough of my comparisons for the moments, folks. Here. Let's have some filmic facts. (1) 'United Artists' first released this picture on the 26th of March, 1969, and clawed back $5 million dollars at the American and Canadian box office. (2) Some of this movie was shot on location within the Californian state of Los Angeles, primarily in Iverson Ranch, Chatsworth. (3) Burt Kennedy plus William Bowers, who respectively directed and wrote this movie, both worked together on such made for television productions, as, 'More Wild Wild West', and 'Sidekicks'. 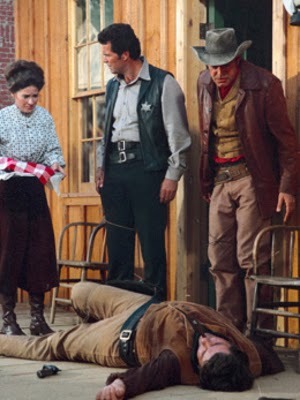 (4) Loosely translated, this project was entitled 'A City against The Sheriff' in Brazil; 'Beware Sheriff' in Finland; 'The Fastest Finger in the West' in Italy; and before it was made, it was given the working title of 'The Sheriff'. (5) Bruce Dern hadn't performed a comedic role prior to starring in this comedy-western, and went on record by saying that he really did enjoy playing against his usual stoic type. 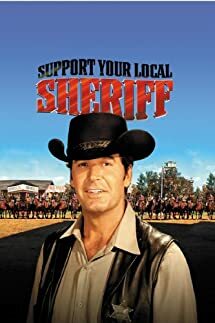 (6) The makers of this movie were inspired to call it 'Support Your Local Sheriff', because of a political 'law and order' slogan devised at the time by Richard Nixon and Ronald Reagan: 'Support Your Local Police'. (7) In 1971 most of the cast that appeared in this flick reprized similar roles for an inadvertent sequel, entitled, 'Support Your Local Gunfighter'. (8) For his role of Pa Danby, Walter Brennan was willing to satirize his character of Clanton from the 1947 Hendry Fonda classic, 'My Darling Clementine'. (9) The title of this film was spoofed in a 1970 episode of the 'Mary Tyler Moore Show' -- 'Support Your Local Mother' -- a 1991 episode of 'Mystery Science Theatre 3000' -- 'Gamera Will Be Back To Support Your Local Sheriff' -- plus a 2010 episode of 'The Super Hero Squad' -- 'Support Your Local Sky Father'. Overall 'Support Your Local Sheriff' was a pretty nice film to watch. The jokes in it were funny. Yet not laugh out loud funny. The story told an actual story. Yet nothing too grand to scream about. And all in all -- yeah -- not a bad movie if you're in the mood for Evil Roy Slade meets the 1966 version of Batman.